1. Wake up at 4am and realize I still have 1 ½ glorious hours to sleep. 2. Go back to sleep. 3. Alarm wakes me at 5:30 from a terrible nightmare…I was on Project Runway and the assignment was to make a pencil skirt out of two ugly 70’s cocktail dresses. Was never so glad to be woken by my alarm! 4. Skip doing the mamas and babies to take an overdue shower! 5. Wake kids up at 6am to get ready for school. 6. Make breakfast and lunches. 9. Drive kids to school, meeting Mr. K to check out timing for having him take the kids the rest of the way to school. 10. Follow Mr. K to see where he works and where he’ll drop kids off. 11. Watch kids walk the last ½ mile to school. 12. Drive to school, passing kids as they are walking. Sad looks coming my way! 13. Greet kids at school and tell them this is the first and last time they’ll have to walk because Mrs. LB offered to pick them up for the last leg to school. 14. Sing with kids during morning worship at school. 15. Drive 45 minutes back home. 16. Discover uneaten PB & Honey sandwich from yesterday’s lunch and eat it for breakfast. It was kinda dry, but good. 17. Move 11 puppies out to the lawn so they could play and I could clean their pens. 18. Deep clean 4 puppy/mama nursing pens. 19. In between cleaning the pens, get 2 loads of laundry through wash.
20. Also in between cleaning pens, answer 3 emails about puppies, and inquire about purchasing UGODOG in bulk. 21 Also in between cleaning pens, unload Costco toilet paper into top shelf of cold storage. 22. Take all 11 puppies back to nursery before leaving to pick up kids from school. 23. Grab water bottle, then drive 45 minutes back to school to pick up kids..
24. Talk with Mrs. LB about carpooling on Fridays. 25. Get kids into car and head to the bank. 26. Deposit dog checks from puppies that were sold almost 2 weeks ago. 27. Snack on string cheese and discover that the yogurt purchased from Costco had never been unloaded out of car yet. 28. Drive home past Mrs. LB’s house to see how many miles and how long it takes from her house to mine, in preparation for tomorrow’s carpooling. 29. Arrive home and give children instructions about backpacks, changing clothes, and getting ready to do chores. 30. Move one more load of laundry through wash (nothing has been folded yet). 31. 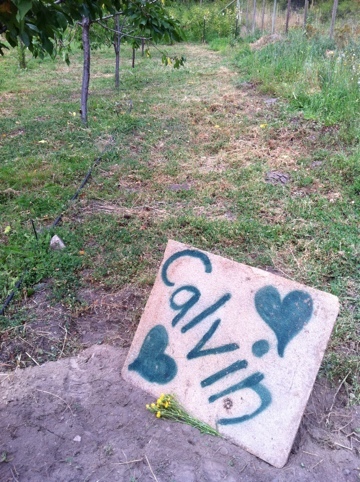 Bury Calvin in fruit orchard. 32. Hook trailer to Explorer for dump run tomorrow. 33. Load dog poop trash, and other trash into trailer to take to dump. 34. Cover trailer with tarp and fish net thingy because it looks like rain. 35. Haul with red wagon, and Kaelyn’s help, 10 bags of dog food from Costco to upper kennel. 36. Feed and water dogs in upper kennel. 37. Oversee Kendrick cleaning trash out of Explorer. 38. Head into garden to see if any tomatoes are red and to dig some potatoes for supper. 39. Pull a head of garlic out of the ground to dry for later use. 40. Admire crop of bell peppers, jalapeno peppers, and misc. peppers (best one ever) and wish I had time to take impressive photos to put on my blog like The Pioneer Woman. 41. Pick bell peppers and have Kendrick take 2 over to the neighbors house. 42. Balance armload of veggies from garden AND open front door of house without spilling any (well, ok, one garlic fell). 43. Wash potatoes for supper. 44. Wash bell peppers for supper. 45. Discover kids ate a yogurt, so aren’t hungry for supper. 46. Abandon supper idea and come into office to write my list. Yes, that was my day (4am-7pm). This entry was posted in About Us, I Was Thinkin'.... Bookmark the permalink. Kaelyn’s name plate for Calvin is so loving & precious! I’m tired now from reading all of that. I know how much my breeder must have worked to raise our puppy. A good breeder is worth her weight in gold. And I also love the feeling when I wake up in the night and realize that I have hours more sleep ahead of me. There is something very satisfying about that.